Little Busters! TV Animation Perfect Visual Book Announced! VisualArt’s have just announced the Little Busters! TV Animation Perfect Visual Book! 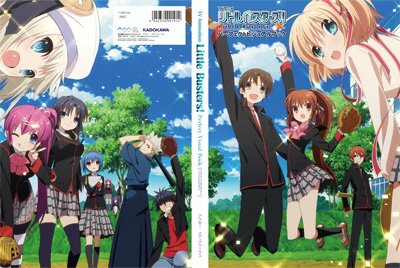 The artbook features pieces produced for the Little Busters! anime series. It’ll include illustrations used in magazines and merchandise, and will also feature story synopses for each episode of the original season, Refrain, and EX. It will be available to the general public from the 27th of September for 4000円 RRP, but will also be receiving an exclusive early distribution at the VisualArt’s Summer event at Gamers in Akihabara from the 11th of September to the 15th, when the event comes to a close. No word on whether any importers will be stocking the product, but we’ll definitely be keeping an eye out for it! It’s surely a must-have item for any Little Busters! collector. Tweet Share Sept. 5, 2014 Goods, Little Busters!